A few weeks ago I spent the first half of the day at Bangkok Hospital taking care of a few odds and ends. I had an eye appointment in the early part of the morning because my right eye was inflamed (thankfully, not infected – doctor said just too much time working on the computer). An hour later, I had an appointment with another doctor about my back, which had a bad muscle spasm that had lasted a week. He proscribed some physical therapy, which was available elsewhere in the hospital complex. When I arrived at the physical thearapy center, though, they were quite busy and the service manager told me I’d have to wait an hour. Since I had my iPod with me, I didn’t mind waiting. 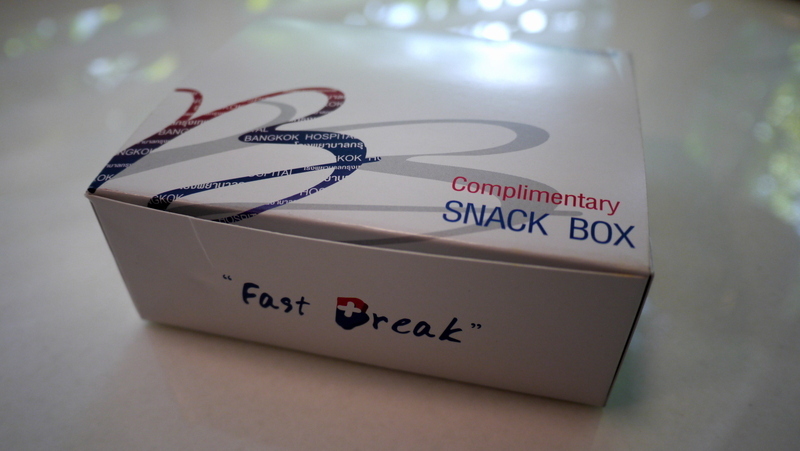 Nonetheless, she came over a few minutes later and apologized for the wait and gave me this snack box. I guess they prepare these for patients who have long waits. While I wasn’t hungry (I brought the box home to photograph! ), the gesture was appreciated. Service in Thailand is generally very good, especially at the hospitals. What do you think of the contents of the snack box, though? Juice and cookies – seems more appropriate for someone who has just donated blood. This entry was posted in Uncategorized and tagged Bangkok, Box, Hospital, Service, snack by christao408. Bookmark the permalink. 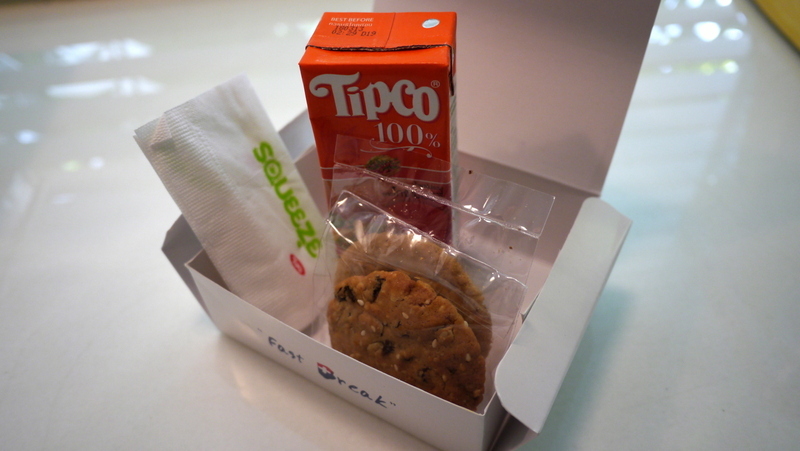 Doesn”t look very healthy but the kindness of giving you a snack box due to your long wait is wonderful. All they want here in the private medical facilities is your money and insurance information. Hubby and I use the VA medical facilities and they always make sure he has lunch and is comfortable. I appreciate their care for him. I agree about the healthfulness of the snack box — but often people who are having to wait use up their internal reserve and need the sugar snack. How nice that they give out such treats. Nice gesture. Sugar to recharge and good for kids and blood donors too. Nice gesture. Maybe it is also given to those donating blood. Wow. I should have my eye checkup and physical therapy over there! What a great gesture! I think the gesture in itself is extremely gracious. I wish hospitals and clinics do that here. I used to have my patients in the office, get juice of some kind, if they had to come in to give blood for lab work, and if there were children, we gave them cookies or small rolls. They appreciated that a lot. Where else do they give out meals to waiting folks? Jails and prisons in America. In a way you are sort of being detained.I suppose if you were stuck on a waiting plane, they also give you some snacks. The airplane passengers would riot if they ran out of snacks and had to wait on a plane. looks like they wanted to keep your blood sugar up since there is nothing there but sugar. in the states they don’t give out snack boxes but there is coffee all over the place for free and if you give blood you get orange juice. again to keep your blood sugar up so you don’t faint. @grannykaren – @ZSA_MD – @beowulf222 – @Fatcat723 – @slmret – @murisopsis – Yes, I suppose the “real” purpose for these boxes is for folks who’ve donated blood or otherwise had a lot of blood pulled. It is a nice gesture, though. @PPhilip – If I recall from my days at United, there are some sort of shelf-stable snacks stored on the planes for extended delays away from the gate. Thankfully, that doesn’t happen too often. @Inciteful – Glad you enjoyed. The interesting things I encounter here in Thailand. @awoolham – There are lots and lots of folks who come here for medical procedures, both general and detailed in nature. Quality is world-class, service is fantastic, and prices are much lower than in the US. @CurryPuffy – I should have looked on the bottom of the box. Perhaps Nok Air caters it! @Grannys_Place – I’m glad to hear the VA is doing right by you and your husband. While I don’t have any first-hand experience with the VA, I always hope that we are taking good care of our veterans. We rarely get anything at our waiting rooms. Sometimes a volunteer will come by with juice (colored sugar water) and cookies (fat, flour and sugar). I hope your back is feeling better now. @ElusiveWords – It is, thanks. The heat treatment the physical therapist did was most helpful.